St. Gallen is proud of its Lokremise: the building was constructed in 1911 and it is the biggest still preserved locomotive ring depot of the country. Located in the city center and only a few minutes away from the central station, the venue welcomes its guests as an interdisciplinary cultural center and as the second stage of the municipal theater. However, due to the adaptable room layout inside of the renovated historical monument only theatrical forms are possible on site which leave behind the traditional room layout between stage and audience. Also for the realization of varied events, the Lokremise can be used. Due to the base of 3,000 sqm as well as the 6.5 m high ceiling there are only few events which could be too big for the rooms. The Lokremise offers space for 800 people on different big events. And it is also suited for smaller occasions such as birthday parties or events from the fields of art, education and politics. With 605 sqm the theater 1 offers the most space, while theater 2 measures 416 sqm. The art zone includes 570 sqm of space that helps you with the conversion of individual happenings from mid-November till the mid-January. The KinoK, which is integrated in the house, shows more than 230 films per year in the normal running of the theater, thus amounting to 1,000 shows. Therefore, film is seen as an art form to reflect upon and to discuss about. Use it with a maximum of 95 people in the course of your own business event! 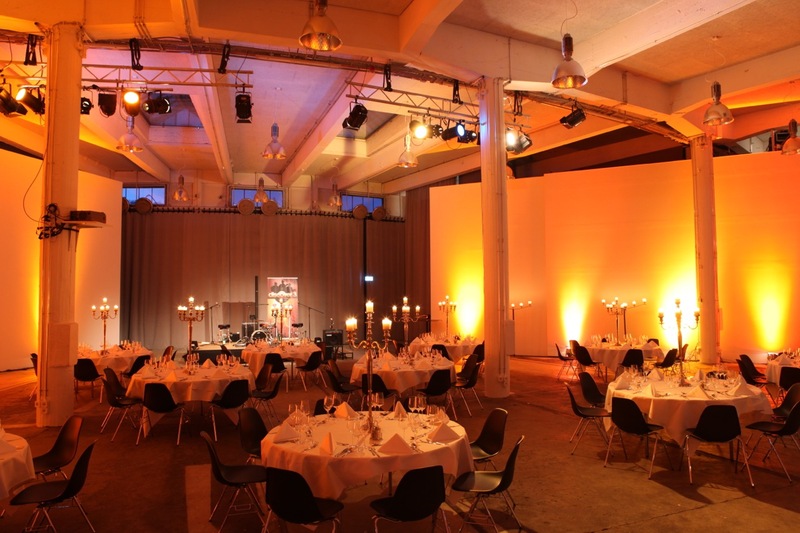 The Lokremise is also suited for the realization of different company events like conferences, seminars or talks. The big and high rooms are almost predestined for exhibitions or presentations. Also, festivities of every kind can be carried out together with the staff in our house. Besides, you are supported by high-class sound, light and video technology. Benefit from a digital projector and screen, microphones as well as a stage lighting system. With pleasure, we provide to you one of our engineers for the professional use of our facilities. You can choose the equipment with seats, bistro tables and tables individually according to your purpose. Please understand that our location does not have parking bays belonging to the house. However, you find various public parking garages nearby. Our excellent gastronomic team provides delicious meals. Whether typically Swiss menu or vegetarian dishes - decide according to gusto! The local cuisine definitely is our passion which we prepare in creative manner. Our buffets change weekly, the menus even daily. We attach special value to the use of regional and seasonal products which we process within the course of an own small event in our show kitchen on the occasion of the actual event. The way we serve the dishes represents another specific feature; since we allow you to arrange them by your own! We deliver them in the pot or in the bowl, the rest is left to your creativity. Our restaurant offers room for up to 130 guests at the interior with bar and lounge. In the warm season the outside roundabout with BBQ, panoramic view and another 300 seats is also available.